Model 70P - Numberall Stamp & Tool Co., Inc. The Model 70 Press has the same features of the Model 70 Hand, but is equipped with a standard press shank for use with most hand or power presses. Model 70P maintains a one-piece frame and shank made of heat-treated alloy steel. Adaptable and versatile, this press is ideal for stamping repetitive sequences with consistently uniform character alignment and impression depth. The same character sequence is retained after each impression is made, unless changed by the operator with the convenient spanner wrench. This makes the Model 70P ideal for marking metal parts for machinery, name tags, electronic circuit boards and parts, keys, food packaging, cardboard boxes and plastic parts. The versatility of the Model 70 has made it popular with many different industries. Multiple wheels are held precisely in position by retaining pawls and retaining pawl springs. A retaining pawl seats the index plate on each of the one-piece wheels. This one-piece construction assures more accurate stamping than those obtainable with two piece wheels. A pawl block further aids in maintaining wheel alignment. The wheels are meticulously engraved for accuracy, strength, and alignment. Crafted from high grade tool steel, they are precision heat treated for severe usage and long life. Unlike the less-rugged designs of other manufacturers, we optimize our frame designs to be compatible with the number of wheels desired by increasing the frame and leg width. All 5/32″ – 1/4″ machines are constructed using larger diameter wheels, wheel shafts, and frames. The Model 70P can be adapted to virtually any press. 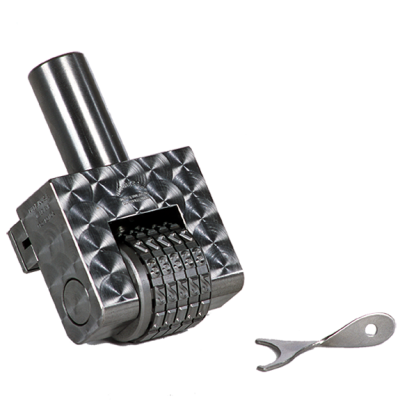 Our standard shank is 1″ x 1-1/4″ or 1” x 2.” We offer a standard dovetail shank to fit Numberall’s hand and power presses or Model 116 Dovetail Adapter. We can make custom round or rectangular shanks. We can omit the shank and provide tapped mounting holes or install a custom designed adapter. We also can leave the top flat so the customer can drill and tap or mount an adapter. Wheels can be engraved with any character, symbol, or style. Contact factory for pricing and availability. Note: Consult our Price List for the number of wheels, character sizes and non-standard round or dovetail shanks available. Consult our Length of Impression Gauge to determine character size required and associated Length of Impression. Our Price List and Length of Impression Gauge may be obtained by requesting our catalog. By using shanks outlined in the Price List, the Model 70P can be easily adapted to the Model 98 and Model 47 Platforms. For presses requiring a special shank other than round, please request a factory consultation.